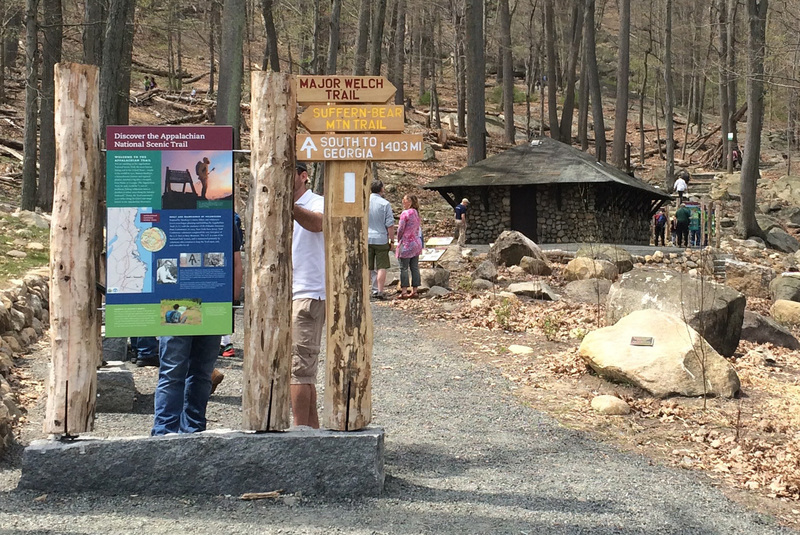 At Bear Mountain State Park we are developing the second phase of Trails for People, a unique play-based exploration of trail design features that we completed in 2016. The components of Trails for People, all exterior, function equally well as play experiences for non-hikers and as tools for training novice NY-NJTC trail maintainers, or stewards. Now we are repurposing a historic Civilian Conservation Corps-era comfort station on the site to house exhibits on the vibrant and evolving experience of hiking the Appalachian Trail, a journey through space and time: history and geography. Nearby, at the Trail Conference’s headquarters campus – a restored 19th Century schoolhouse set on the banks of a revitalized stream and wetlands – we are creating self-guiding site interpretation that highlights sustainability and ecological features such as carefully preserved freshwater turtle nesting habitat, while exploring philosophical interrelationships between historic preservation and environmental stewardship.